Look at the right bottom corner of my new book’s cover. 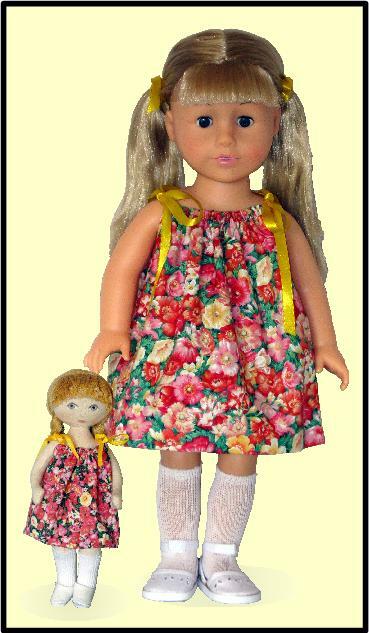 Florabunda is wearing a sundress that matches the eighteen inch doll’s dress. 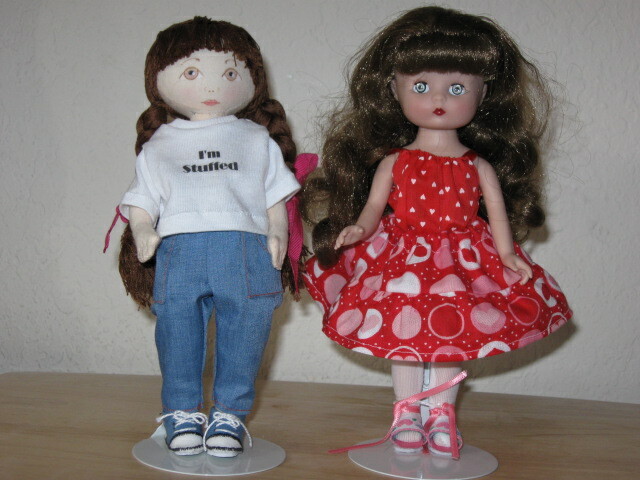 Here is a close-up of the two dolls. The pattern on Florabunda’s dress is scaled to match her smaller size. 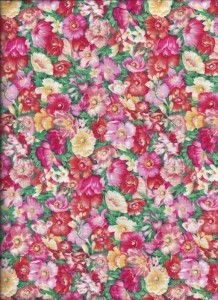 The smaller size print was not available at a fabric shop, so it was printed with a computer printer on printable fabric. 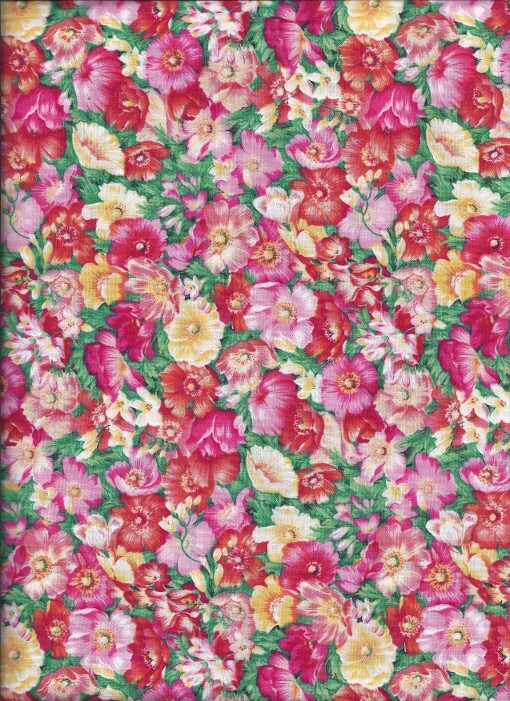 I do not have the skills to create this interesting fabric on my own. I had my husband’s help and we found that the project took more effort than we expected. The first step was to scan the original fabric. 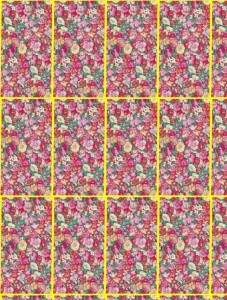 Then we picked out a rectangle of fabric that included the complete design without any repetition. My husband used a photo-processing program to straighten the design so that it would match the straight of grain when it was printed. He also used the program to crop the scan, leaving only one complete design. While he was still in the program, he shrank the design and then repeated it until the now smaller design would cover a sheet of printable fabric. The colors on the first printed sheet did not match the original. We went back to the photo-processing program and worked on making the colors match. We printed several paper samples before using another sheet of printable fabric. 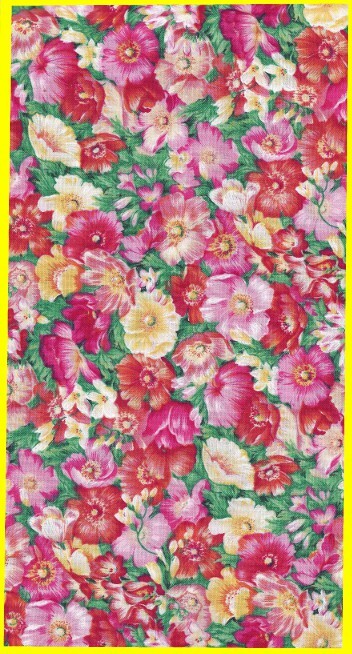 The computer printed fabric is a little more difficult to sew on than regular fabric. It is slightly thicker and does not drape as well. It took some effort but, I was happy with the little dress when I had finished it. Start sewing at the top of the stuffing opening on the left side of the opening. 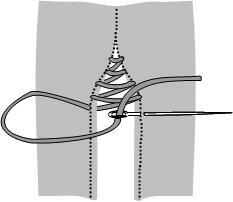 Hide the thread knot by inserting the needle into the top of the stuffing opening and bringing it out on the left side. Make a stitch straight across the opening to the right side. 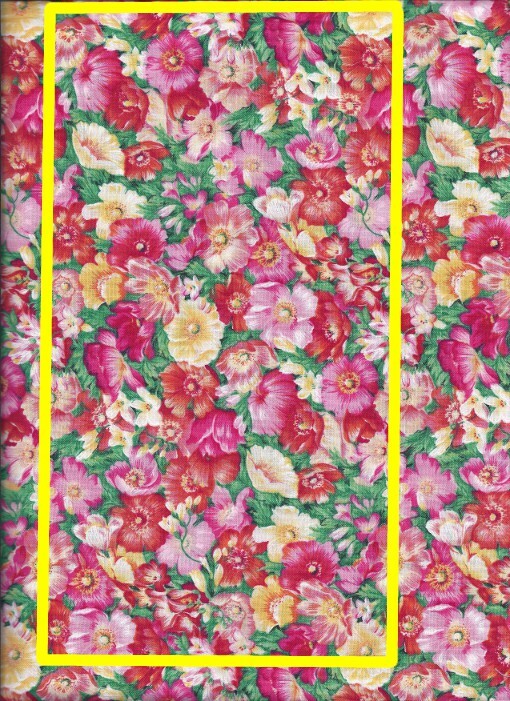 Make the second stitch going right to left slightly slanted. The second stitch in each pair will be inside the closing, so that the visible stitches go straight across the stuffing opening. Pull the stitches tight as you sew. 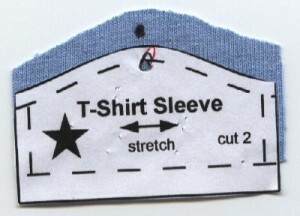 The figure below shows loose stitches to illustrate thread placement. Tuck the raw edges of the stuffing opening inside the arm or leg. Hold the edges of the stuffing opening together as you sew. Sew both sides of the opening together with each stitch. Keep the stitches small and close together. In doll patterns and doll crafting magazines the invisible hand stitch used in doll construction is called the ladder stitch. 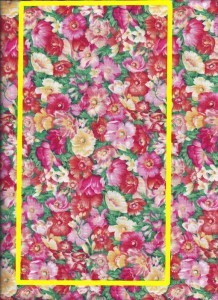 In embroidery books the ladder stitch is a decorative stitch that looks like a ladder. The doll maker’s ladder stitch is similar to the slip-stitch, but it is done on the outside of the doll. The doll’s head should be stuffed. I like to stuff the body after I have connected the two pieces, but I have been successful sewing a stuffed head to a stuffed body. Position the doll head on the doll body. Use a few pins, if you like, to hold the two parts together. I usually just hold the two together as I sew. Take a small stitch in the head. Pull all the thread through each stitch as you take it. Take the second stitch in the neck. Go back to the head for the next stitch and make it very close to the first stitch. Take only one stitch at a time. Pull the thread completely through each stitch as you take it. Do not overlap the edges as you sew. Take a small stitch on one side of the opening. Take the second stitch on the other side of the opening. Go back to first side for the next stitch and make it very close to the beginning stitch. Continue back and forth. Keep the stitches very close together. You should take between fifteen and twenty stitches per inch. Next week I will blog about using the overcasting stitch. This week I am going to write about some very basic hand stitches. 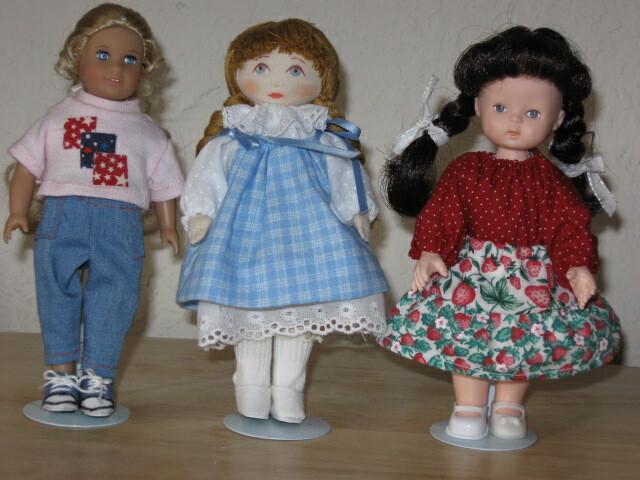 Next week I will write about some slightly more complicated hand stitches that are very useful for doll making. One stitch is defined as the needle going into and coming out of the fabric. Several stitches are made with the needle before the thread is pulled through the fabric. Basting stitches are running stitches used to hold fabric together so that it can be sewn with a machine stitch. Hand gathering stitches are running stitches that are pulled so that the fabric is gathered over the thread. A slip-stitch is an almost invisible stitch. It is a good stitch to use when putting in a hem. Finish the raw edge of the garment to be hemmed. Press in the hem. 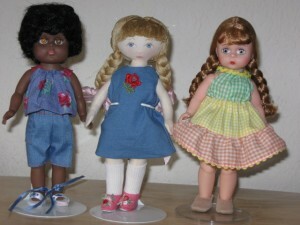 For these small doll patterns the hem is usually half inch. Use a few pins to hold the hem in place. Check the length on the doll before continuing. Fold the finished edge back about one eighth inch. Take about an one eighth inch stitch through the folded back edge. Pull the thread through the fabric. Catch two or three threads and take a small stitch on the part of the hem that will be visible on the dress. 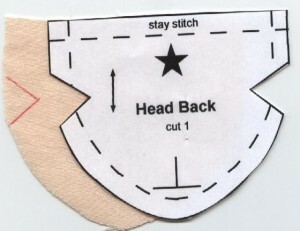 Take the next stitch in the folded back edge. For these small hems the visible stitches should about one quarter inch apart. Last week I wrote about choosing pens and pencils to use when transferring pattern markings to fabric. After you have chosen a writing instrument, you can decide the best method to transfer pattern markings to your fabric. I have listed several of my favorite techniques below. One of the methods discussed requires scissors rather than pens and pencils. Complicated markings such as a doll face to be colored may need to be traced. I have had success with three tracing methods. A clear plastic box picture frame works fairly well when tracing pattern markings. Light should be behind the pattern that you are tracing. The plastic box can be propped up at an angle rather than resting flat on a table. Another solution is to have a battery powered light under the plastic frame. My favorite tracing method is a light box or table. I bought a small inexpensive one years ago. Larger ones may be fairly pricey. I use a small amount of drafting tape to hold the pattern and fabric to my light box. Sometimes you can use your scissors to mark fabric. 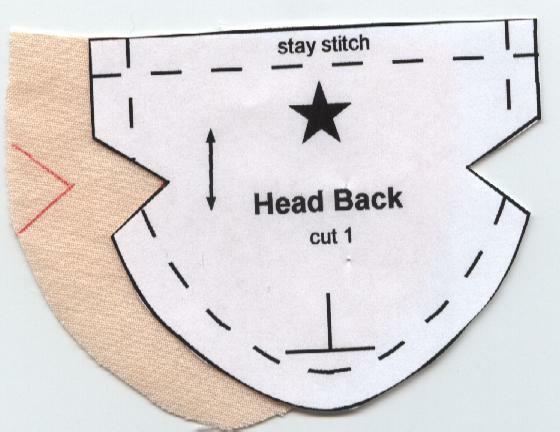 Cut out the small notches in the seam allowance that are used to help match fabric pieces. You can make a small clip in the middle of each notch if you prefer. 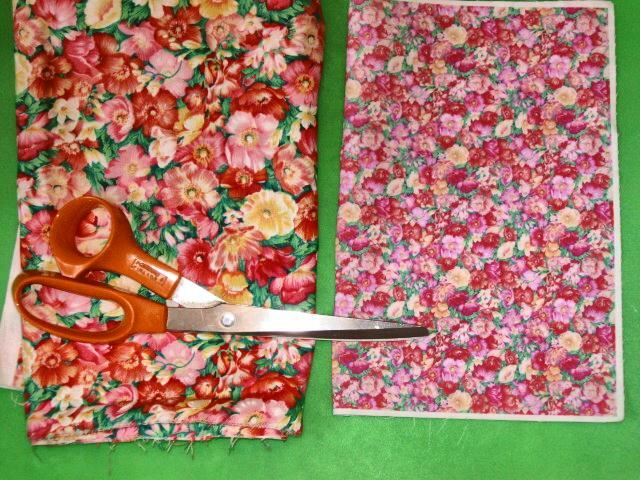 Sometimes you can cut out part of a pattern piece and use it as a stencil to mark you fabric. Rather than tracing darts you can make a second copy of a pattern piece. Cut the dart shape out of the pattern. 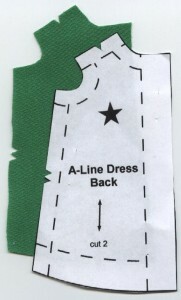 Place the pattern on the fabric piece to be marked. Trace the dart where it belongs on the pattern. Pull a pin with a small metal head through the dot on the paper pattern. 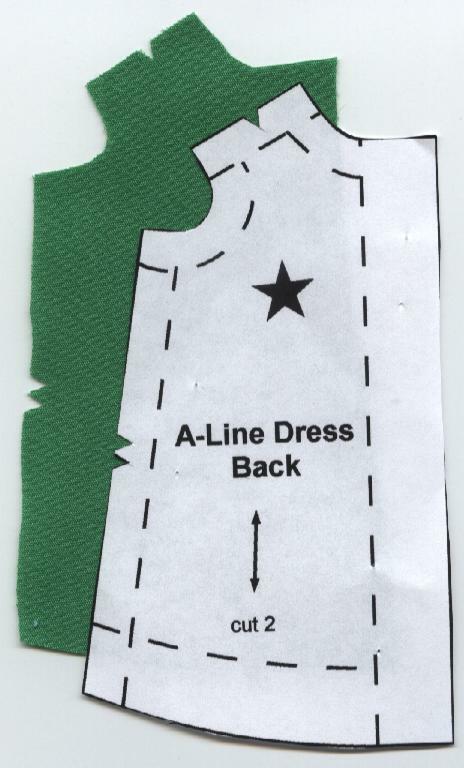 Put the pattern on the fabric to be marked. Use a pen or pencil to mark the fabric through the hole in the pattern. This week I am going to write about choosing pens and pencils for marking fabric. Next week I will discuss methods for accurately transferring pattern markings to fabric. My short cuts work for small doll size projects. They may not work for people size projects. You can find other more traditional methods for marking fabric in sewing handbooks. A thin line air soluble (vanishing ink) pen works well for marking on the right side of the fabric. I find that the thicker line air soluble pens are not precise enough for marking small size sewing projects. Mark with this thin type of pen just before sewing, because it disappears quickly. Sometimes the markings will last a few hours or a few days zipped in an air tight plastic bag. The length of time the marking lasts depends on the age of the pen and the amount of humidity in the air. For marks on the wrong side of the fabric and marks for embroidery designs, I like to use Prismacolor pencils. They wash out easily. I keep a sharp point on these pencils to help mark the fabric accurately. Your can also purchase various colored chalks or try a marking wheel and transfer paper. I like the thin air soluble pen and Prismacolor pencils, because I get a very precise mark from them. Sewers know how important it is to press seams during the construction of fabric projects. In addition to a steam iron and full size ironing board I have several other things to help with pressing doll size garments. 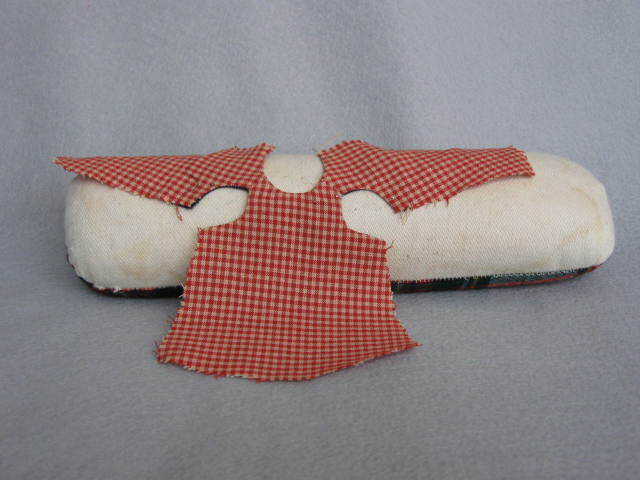 One gadget was made especially for doll dressmaking. I have adapted the other things to help me sew for dolls. 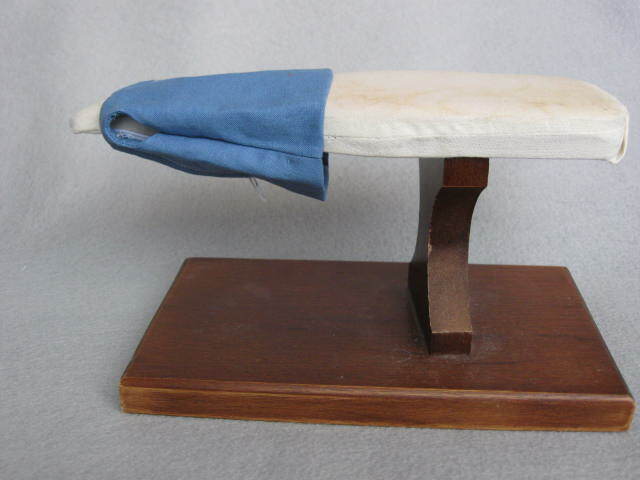 I have a small ironing board that is made for pressing doll clothes. I find it very useful. It makes pressing little sleeves and hems easier. A sleeve roll is sometimes a good choice for pressing small sewing projects, because small pieces can be pinned to it. I plush the pins straight down into the roll as if it were a pin cushion. The pins are difficult to see in this picture, because I used flat head silk pins to make pressing easier. I use light card board strips to help me accurately press under fabric widths. 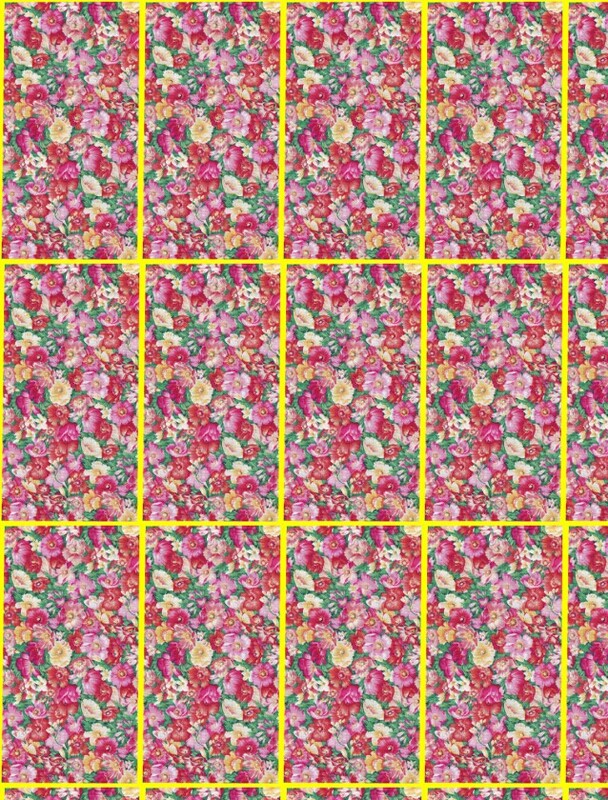 Cut one half inch wide strips from a 5 x 8 inch index card printed with a one fourth inch grid. To accurately press under a one half inch of fabric pull the edge of fabric over the card board strip and press. To press under a one fourth inch of fabric pull the fabric to the one fourth inch line on the card board strip and press. I blogged about sewing tools that I think are important a few weeks ago. Here are some more helpful gadgets. There are two different point turners in the picture. The one is at the top of the picture is helpful when turning curved fabric pieces. The bottom turner is helpful for defining sharp angles. Both turners can help define points. 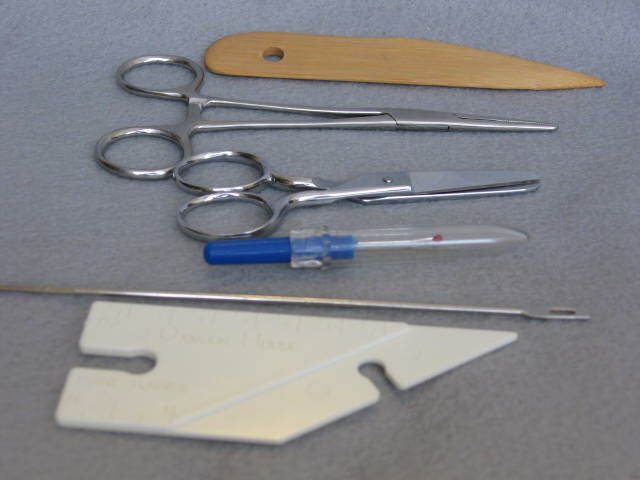 The second tool from the top is a hemostat. 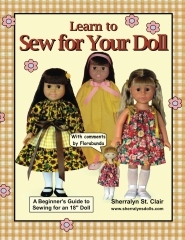 It is very helpful for turning small fabric pieces and stuffing dolls and toys. 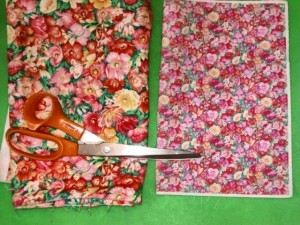 I use my small scissors for clipping seams and for delicate trimming. I need to use the seam ripper more often than I like to admit. The bodkin has appeared in my blog before. It makes it easy to insert elastic into a casing. 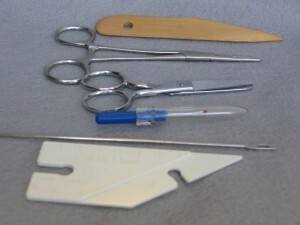 The picture shows a small set of small tools that makes sewing easier and more fun.